On May 12th, 1917 starts the new Italian attack on the front of river Soča – Isonzo: it is the 10th battle. The goal of the Italians is to capture Trieste, by attacking along a 50km front that runs from Gorizia to the Adriatic Sea. The first phase of the attack, carried out by the Italian 2nd Army takes place from the middle course of the Isonzo river in order to distract the 5th Austro-Hungarian Army, forcing it to leave the southern sector, where is expected to take place the main attack, carried out by the Italian 3rd Army lead by the Duke of Aosta. In the sector of Gorizia, the goal is the western border of the Banjščica (Bainsizza) plateau, pending the fall of Austrian strongholds on Mount Vodice, Sveta Gora-Heiligenberg-Monte Santo, and Mount San Gabriele-Škabrijel. Breaking through the plateau of the Banjščica would allow the Italians to threaten from behind the Austrian-Hungarian defense line in the southern sector, the one protected by uncatchable stronghold of the Hermada–Grmada. After two days of hammering bombing, Italian troops attack, but they don’t break through the Austrian-Hungarian lines: the defense on the middle course of the Isonzo holds them back, and the Italian casualties are several. The bloody front attacks against uncatchable strongholds continue, uninterrupted, until May 28th, but the main goal, forcing the Imperial-Royal Army (K.u.K.) away from southern Isonzo to have the stronghold leaving the Hermada sector undefended has failed. On May 23rd – second anniversary of Italy’s decision to enter the was – the Italian 3rd Army attacks in southern Isonzo: the goal is to destroy the powerful Austrian-Hungarian defense lines that runs from Dosso Faiti-Fajiti hrib, to Castagnevizza-Kostanjevica, and to Mount Hermada. The Hermada, which runs to the Adriatic sea, is a long series of hills that bars the way to Trieste; the first port of the Empire is only 20km away from the Hermada: twenty kilometers separate the Italian 3rd Army from glory. But the Hermada is the state of the art of Austrian-Hungarian defenses, and it sums all the teachings acquired during three years of war; it is a massive defensive work that crowns the already powerful K.u.K. of the sectors of the middle course of the Isonzo and the plateau of the Banjščica. The “Hermada stronghold” is protected by a series of parallel defense lines that begin not far away from Jamlje-Jamiano (lake of Doberdob-Doberdò, altitude 144), culminating in the area of the Flondar (altitudes 176 and 146) and from there to the sea (Štivan-San Giovanni di Duino near the mouth of river Timavo-Timav). Behind the Flondar there is Medeazza-Medja vas, with the last defense line on the slopes of the Hermada. Each defense line consists in parallel trenches defended by grids of barbed wires and Chevaux de Frise, behind which there are nests of machine guns. Many caves are used by K.u.K forces are shelters, and they hide many more nests of machine guns that can hit the attackers from the side. From the highest positions, the K.u.K. soldiers do also have free range for their Mannlicher bolt-action rifles, which can hit in a range of 14 meters. And then, behind the defense lines that protect it, there is the Hermada: the “delightful hills” that descend into the sea are full of cannons and machine guns, as well as of shelters dig into the rocks of the Karst. The Hermada is an underground stronghold that hosts thousand of men, protecting them into its bowels: it is a masterpiece of Austrian-Hungarian military engineering. Also, the Hermada is the base of Austrian-Hungarian artillery in southern Isonzo, with its easy batteries of 240, 305, 380, and 420 mm cannons that hit Italian troops as far away as 30km. And then mid-range artillery, that based on 75, 100, and 150mm pieces, that do inexorably hit hundreds of meters all around with their direct strikes. A frontal attack seems impossible, even getting around this enormous wall of artillery, it would be just like going for a mass shooting: a collective suicide. But Italian strategists, obsequious to the order of Generalissimo Cadorna, have come up with nothing but this plan: hammering bombing, frontal attack. Italy does still have lots of men available, cannon fodder, to be sacrificed in the name of the Fatherland. At the dawn of May 23rd, Italian artillery launches the attack, hitting the southern front with a huge bombing. At 6.16AM, cannons hit the Austrian-Hungarian defense line. The main goal of the bombing is to annihilate the Hermada that, under the crossfire of the heavy artilleries which, from Punta Sdobba (mouths of the Isonzo, where there are the batteries of the artillery of the Italian Navy, with 381mm pieces) to De Bela Griža-Mount S. Michele to the plateau of the Isonzo, which seems like the eruption of a volcano. In ten hours, on million hits devastates the Austrian-Hungarian defenses on the Karst: 56 grenades for each square meter of the front. In many places, the grids are thorn and the trenches destroyed. At 4MP the Italian infantry is launched to the assault: one wave after another, one regiment after another, Italian troops fight on the Karst plateau, in a desperate attempt to occupy the main altitudes, their tragic names are altitude 432, 379, 276, 247, 242, 241, 235, 175, 146, 144, 77, and many more. Italian attacks and Austrian-Hungarian counterattacks continue, uninterrupted, for six long days: extremely violent fights with thousand of casualties and heroic actions, on both sides. In the northern area of the plateau of Komen-Comeno, Kostanjevica, defended by the Honvéd falls to the Italians and is conquered once again by the Austrian-Hungarians with a quick and fierce counterattack, with fights in close combat. The Honvéd themselves, trapped in Hudi Log, stand firm without giving up, to the last man. On the south, Italian troops break through east to Jamiano and reach the top of the Fornaža, occupying altitude 77 “Sablici”. The following clash with the Hungarians and Rumanians of the 37th Honvéd Infantry Division allows to partially retrieve the lost positions. The main break through takes place on the Flondar, where the troops of the Italian 3rd Army take firm position after four days of harsh fighting, reaching Medja vas to the slopes of the Hermada, their maximum advance. Along a 20km front, the Italian 3rd Army was able to enter 2km in depth, but the price is an impressive number of casualties. This is their gain, at the end of the tenth battle of the Isonzo, on May 28th. But having lost the Flondar, three kilometers northwest to the Hermada is a serious problem for the Austian-Hungarians. Now Italian are close to the “Hermada stronghold” and the K.u.K. had to draw their artillery back after losing important viewpoints, also, now the Flondar is the base of any future Italian attack to the Hermada. So, when the Italian attack ends, the commanders of the Austro-Hungarian Fifth Army decide to launch a counterattack to fix the southern front in order reduce the pressing of the enemies on the Hermada. The attack is organized quickly and approve by Feldmarschall Boroević. For the first time, on the Isonzofront, are used the newly established “Sturmtruppen”. The goal is to recover the highest altitudes of the Flondar and retrieve the long defense line that reaches Štivan (mouths of river Timavo – Timav). The troops involved are from the 28th and from the 35th Brigade, from the 11th and from the 12th Mountain Brigades, as well as from the 28th Infantry Regiment from Prague. On June 3rd, the main attack is preceded by a diversion: an attack on the north, on the Fajti (altitude 432). At 9PM, the K.u.K. troops of the 39th Regiment attack the Fajti and conquer its altitude, the Italians prepare their counter attack, but during the morning the K.u.K. had quickly changed their positions and, instead, they go for the main attack on the south, near the sea. At dawn, on June 4th, the K.u.K. artillery attacks the Italians that were in front of the Hermada; the destructive fire lasts only 40 minutes, but it devastate the trenches, now occupied by Italians, there are many casualties. Under this fall of fire and iron, many Italian troops hide in the caves turned into shelters and in the two railway tunnels of the Monfalcone – Trieste railway, between Štivan and the Flondar, which soon become traps for them. 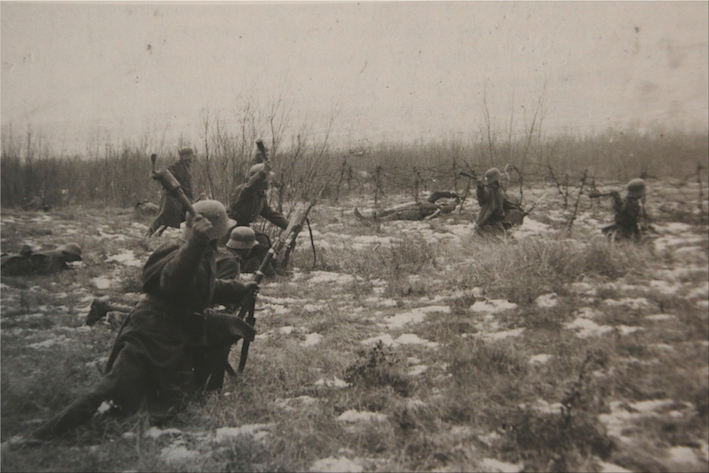 The Austrian-Hungarian Sturmtruppen are the first to attack. Here is involved the hole newly-established battalion (Sturmbaon) of the 5th Army; it is four companies (from the 1st to the 3rd, plus that of armored vehicles) with about 600 men. The duty of the Sturmtruppen is fundamental, on their success depends the following attack on a 6km front, from Medja vas to the sea. It is all about destroying Italian defense lines, breaking through, and keeping the breaches open to allow all other K.u.K. forces to count attack from behind Italian troops, trapping them. The Sturmtruppen attack before their own artillery stops firing, so, taking advantage of the protection of the heavy artillery K.u.K. from the Hermada, not without casualties, they capture altitudes 175 (Flondar) and 146. Italian troops are taken by surprise in their shelters. The four companies of Austrian-Hungarian assault troops do quickly take position in the trenches, they place the machine guns to protect them, and “clear” with hand bombs and explosives the caves used by the Italian troops as shelters. All Italians surrender: the Sturmtruppen capture more than 2,000 prisoners. Before the commanders of the Italian Third Army can organize a reaction, the Austrian-Hungarian troops are already entering the breaches opened and protected by the Sturmtruppen and conquering again the defense line, attacking Italian troops from behind. 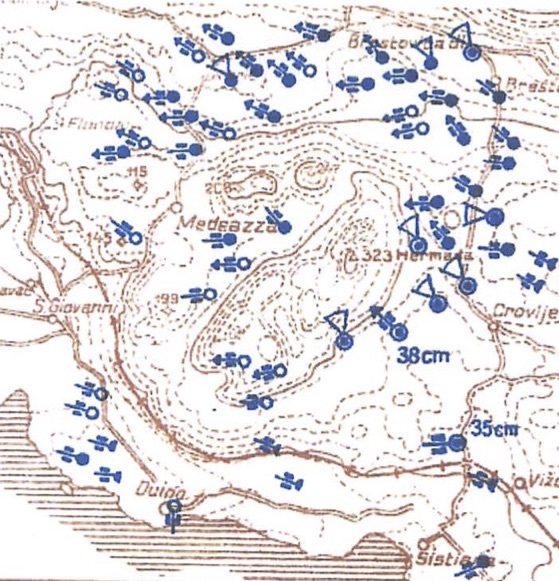 In this action, the 28th Infantry Regiment lead by Major Meergans, who cover themselves in glory with harsh fighting in Štivan, winning back the previous positions and pushing Italian attacks back, until night. But the victory has a high price for the Czechs of the 28th Infantry Regiment, because 2/3 of them are either wounded or killed. In their fast break through, Austrian-Hungarian troops sweep away four Italian brigades and capture thousand of prisoners: at the end of the day, there are no less than 10,000 (thousand of them were trapped and captured in the railway tunnel between Štivan and the Flondar) as well as lots of ammunition and weapons, including 100 machine guns. It is a total victory: in a few hours, with an operation wonderfully carried out by the well-trained troops of the Austro-Hungarian Fifth Army, most of the land lost on the southern front during the 10th battle of the Isonzo is retrieve. The role of the Sturmtruppen is fundamental, as underlined also by the command of the 3rd Austrian Hungarian defense sector in his report: “the reconquering of 3 of our cannons, the capturing of 10,000 prisoners and 100 Machine-guns firing the counterattack on the front of the Flondar are, considering that the majority of the troops are not used to fight on the Karst, a non little merit of the Sturmtruppen. Anyways, they have victoriously opened the way to the troops attacking the enemy positions”. But this success has a high price for the Sturmtruppen: 24 are dead, 98 are missing, and 163 are wounded; this means 50% of them. This is the first, vast-scale engagement of Imperial-Royal assault troops, who prove their powerful effectiveness that would be confirmed once again, in a few months, during the 12th battle of the Isonzo: the victory of Caporetto-Kobarid. The 10th battle of the Isonzo ends with the usual carnage wanted by Italian high commands that implement the strategy of “generalissimo” Luigi Cadorna. The casualties of the Italian Royal Army are huge: 36,000 are dead, 96,000 are wounded, and 25,000 are missing. The casualties of the Austrian-Hungarian 5th Army, which for its powerful resistance, on May 24th, 2017, receives by Emperor Karl I the official name of “Isonzo Armee”, are about 8,000 dead, 47,000 wounded, 25,000 missing or prisoners. The Italian army loses 157,000 of the 280,000 soldiers engaged on the front of the middle course of the Isonzo (56%). The Austrian-Hungarian Imperial-Royal army loses 80,000 men out of 160,000 (50% of the soldiers engaged). But the lesson of the 10th Battle of the Isonzo is not enough for Italian “strategists” and, soon, another great carnage is offered to the gods of war: the battle of the Bainsizza is about to begin.